The way we have our QA environment set-up we use a DNS server this allows us to mimic the live environment (the customer facing server names are the same as in the production environment). It sounds ideal however it isn’t without problems. We cant set-up a banner server in our environment (because we use a third party banner service) nor can we set-up a WA server (we use multiple WA vendors) so we have to use proxy exceptions that excludes everything from going through the proxy that exists in inside the QA environment. This obviously means we can end up with a pretty big proxy exceptions list in our browser. Firefox isn’t a problem as there are a couple of plug ins available that can manage multiple proxy settings. However IE requires us to use a hand crafted batch file to update registry settings. Not really a problem, and we are comfortable with how it works. It rarely catches us out. Now when we cam to automate our tests with selenium we ran into a problem. We needed to tell selenium to use our corporate proxy so it can proxy request to the outside world, and when selenium starts the browser it tell the browser to use a particular PAC file that is generated at test run time. The PAC file is quite simple and tells the browser to use Selenium for anything that lies within the SUT else go external. sound’s great except that it doesn’t work. We read a few forum posts, and blog posts and scratched our heads. Finally we opened the Selenium source code and found that we could in fact pass in a list of hosts to apply to the proxy exceptions list. We were feeling pretty jaded are spending hours of google time on it, why its not documented clearly anywhere i don’t know. This means that if the request is for anything other than www. or search . 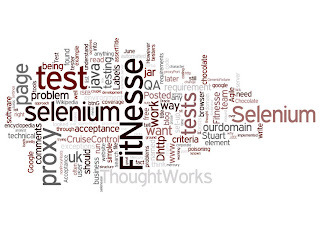 on our domain, selenium forwards it through our corporate proxy.